Hungarian scientists are working on computer software analysing dog barks that could allow people to better recognise dogs’ basic emotions, Hungarian ethologist Csaba Molnar said. January 16, 2008 Posted by oldstersview | animals, Strange	| Comments Off on Talk to your dog? Brian and Ross DeVol are a perfect match, genetically and academically: The identical twins earned perfect ACT scores. The seniors at suburban Bellevue East High School both scored 36 on the college entrance exam, though Ross DeVol needed three tries. One of his earlier tries netted a 35. The 18-year-old brothers have maintained straight-As through high school, and both are in the running for class valedictorian. Today’s weather: Cloudy with showers of milk…Wait! Milk?! The New Mexico Environment Department is looking into what caused a strange milky white rain to fall on Grant County Monday. Area residents noticed the unusual rain as it left white puddles and a white, almost sticky residue everywhere. Stone said the NMED is looking at several possible reasons, including wind and weather patterns that might have brought the unknown substance to the area. Two semi trucks with tire problems on the side of I-196 [near Grand Rapids, Michigan] were clipped by a third semi truck, which then spilled 40,000 pounds of pork. The two semis were stopped on the side of the highway with their flashers on around 7 a.m. Wednesday. 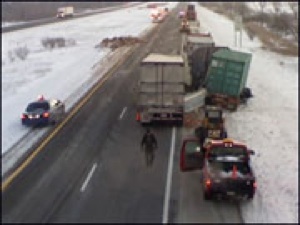 The third semi approached the trucks and clipped the second truck, which was then forced into the first semi. The third semi’s trailer became disconnected from the cab, and 20 tons of pork spilled onto the expressway. Two Bulgarian brothers have divided their family home with barbed-wire after suing each other more than two hundred times. Taso Hadjiev, 74, and his brother Asen, 75, from Malka Arda in Bulgaria first sued each other in 1968 in a dispute over land left to them by their dead parents. Since then they have had persistent fall-outs and neither ever had the money to leave the home they grew up in because they used any income they had paying lawyers. 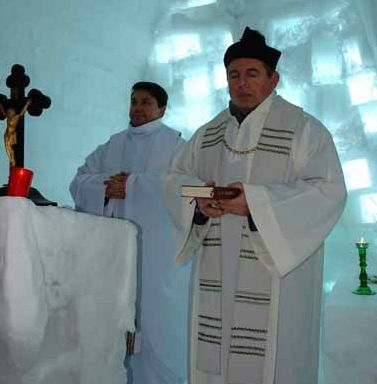 A church made completely from ice in Romania has proved so popular it’s had to ban candles to stop it from melting. Managers of the church in the Carpathian Mountains have been flooded with requests to carry out weddings and baptisms. So many services were taking place that the candles were burning almost non stop – damaging the church interior. The 200 sq ft church was built near Balea Lake, 6,673 feet above sea level, by local businessman Arnold Kingleis who has also built a nearby ice hotel.